Impressionism is interesting to me largely because of the transition point it played in the world of art. Much of the art progression before was about creating work with increasing fidelity. We progressed from cave drawings to paintings like the work of Johannes Vermeer — paintings with so much detail they seem like photographs. Impressionism, however, is not about trying to dazzle us with fine resolution. It is about finding a way to express the essence of the subject. It’s more interpretive. There’s substantially less detail, but somehow it seems to dive deeper. I have nothing against resolution. My landscape camera produces 50-megapixel images, allowing you to see fine details in the tiniest subjects of my images. If I could get a higher-resolution camera that worked with my lenses, I would. But there are elements of Impressionism — no matter how blurry it may seem — that help me make better use of every camera pixel. One is the overall idea of simplification. I believe art should express something. Often, I try to create images that help the viewer feel the same way I felt when I was standing at that location. I think the images are stronger if they contain only what they need to to say what I’m trying to say. Extra elements are just distractions. Impressionism has taught me a lot about color — how certain colors feel and how they can almost be used like words. And Monet’s work has helped teach me about using environmental elements. The weather, the time of day, the time of year — all those elements play a significant role in determining what the overall scene expresses. Monet created several series that explore that concept. One of his most notable works is a series of 25 paintings of a set of haystacks. They’re all of the same haystacks, but they’re more different than alike. One of my favorite images of my recent trip came from the cliffs of Étretat. It was a favorite subject of the Impressionist painters. Monet painted them several times. Delacroix, Courbet and Boudin, too. The chalk cliffs are geologically similar to the more famous White Cliffs of Dover, and stand as tall as 300 feet over the English Channel. 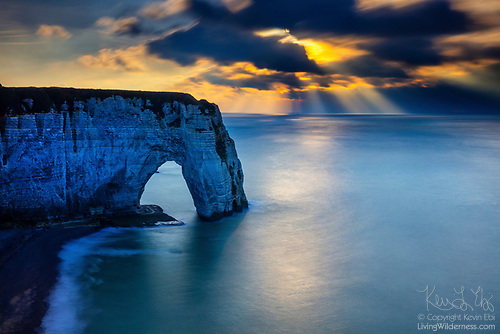 Three natural sea arches add even more drama to the scenery. I think it’s one of my strongest images of the year — and much of its impact comes from techniques Impressionists used effectively. The most obvious is its use of weather. Impressionists, who began painting on location instead of in their studios, made great strides in incorporating weather in art. They didn’t just paint in some clouds. You can often feel the weather, whether it’s the temperature or the wind. In art, this color technique was perhaps used most effectively by Picasso during his Blue Period at a transition point between late-Impressionism and more abstract painting. And by coincidence, a few days after I made this image, I got to see an extensive exhibit devoted to Picasso’s Blue and Pink periods at Musey d’Orsay in Paris. I made plans to visit the museum without knowing about the special exhibit. Some of my favorite works of his are his Blue Period paintings of Barcelona and it was a treat to see those in person and consider how I had borrowed those concepts in my own work. 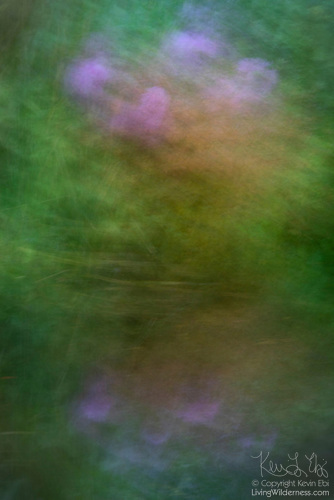 Another trip highlight was visiting Monet’s garden at Giverny and I couldn’t resist creating my own work of Impressionism. It was largely driven by necessity. The garden was about to close for the season when I visited and the water lilies were a bit past their prime. Still the colors were incredible. I moved the camera during a long exposure to blur the image so that any dead leaves were washed under the vibrant colors. While today’s cameras are incredible devices and are technically able to create pleasing images without a lot of thought on the part of the operator, I do think about what I’m trying to accomplish before I push the shutter button. And it was wonderful to spend time in the footsteps of those who have given me so much to think about.